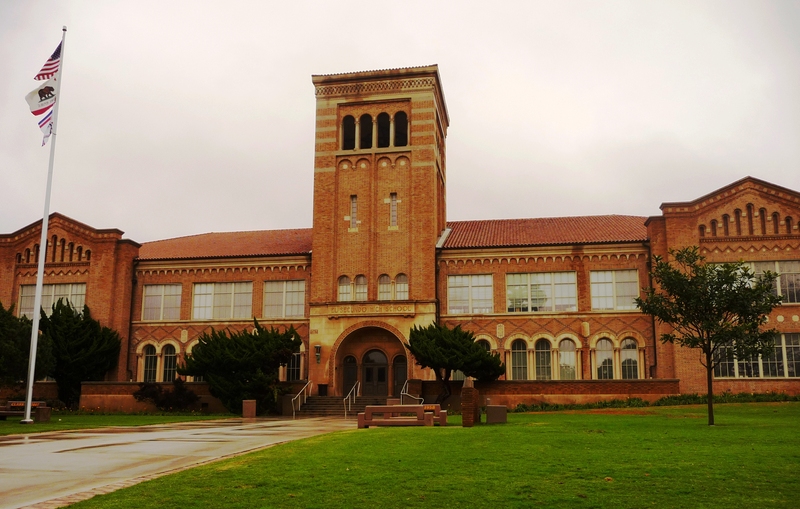 Is School Facility Funding in California Adequate and Equitable? A new UC Berkeley Center for Cities+Schools study finds that more than half of California’s K-12 school districts underspend on their facilities, compared to best practice spending standards. This is the first in a series of blog posts on our research findings and their implications for state policy. Public education funding is undergoing major changes in California. The new Local Control Funding Formula (LCFF) significantly restructured education program funding – providing more money overall and instituting a new formula that gives more funding to districts with targeted disadvantaged students (see the details here). Though it’s been making fewer headlines, state funding for school facilities has also drastically changed. While LCFF changes are generally good news for schools across the state, the outlook for facilities funding is much bleaker. The School Facility Program (SFP), the state bond financing that provided about $35 billion in grants to local districts for new construction and building modernizations, is completely out of money. Gone, too, is the Deferred Maintenance Program that provided annual funds to districts. As the California School Boards Association (CSBA) recently described, the Governor, the legislature, and other stakeholders are debating the state’s school facility funding role and what programs—if any—will replace these past supports. In our new UC Berkeley Center for Cities+Schools study Going it Alone: Can California’s K-12 School Districts Adequately and Equitably Fund School Facilities?, Liz Jain of Berkeley’s Goldman School of Public Policy and I look at school facility spending patterns in recent years across California to better understand what the likely outcomes are if no new state funding becomes available to assist school districts in the upkeep and construction of their facilities. For the study, we use National Center for Education Statistics data on maintenance and operations of plant (M&O) and capital outlay that California school districts reported to the federal government for the years 2008-2012 (the most recently available) in the Local Government Finance Survey. We compare spending in those categories against minimum spending standards used across the building management field to ensure buildings stay in good repair. The best practice standard is to spend 3% of the replacement value of the building on M&O and, simultaneously, another 2% of replacement value on capital renewal each year. See the paper for a detailed discussion of these standards and our methods. Most importantly, our analysis finds that that many school districts—particularly those serving high-need students—risk grossly underfunded facilities budgets and deteriorating schools if they are on their own, without state support for facilities. Underfunded school buildings will, over time, cause or accentuate health problems among children, undermine teacher performance and student achievement, and have a shortened useful building life. All of which are bad news for California. Specifically, what did we find? The majority of school districts in California have not been meeting minimum annual facility expenditure benchmarks, even—in many cases—with state funding. Between 2008 and 2012, substantially more than half of districts (at least 57%) did not meet industry benchmarks for spending on capital renewals and more than 60% failed to meet the benchmark for basic maintenance and operations. In many cases, the same school districts are falling behind on both measures. Districts with more taxable property value (as measured by assessed value, or AV) per student have, on average, raised more capital funds to pay for facility needs than districts with less taxable property value per student. 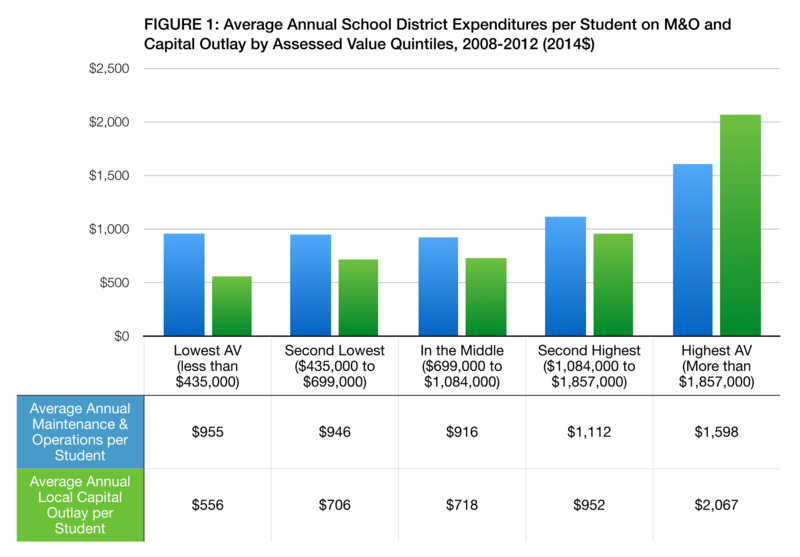 In particular, districts with high AV per student spend more on the capital side. The chart below shows average annual per student M&O and capital spending for all school districts divided into equal size groups (quintiles) based on their AV. School facility needs place higher budget burdens on school districts serving low income students. 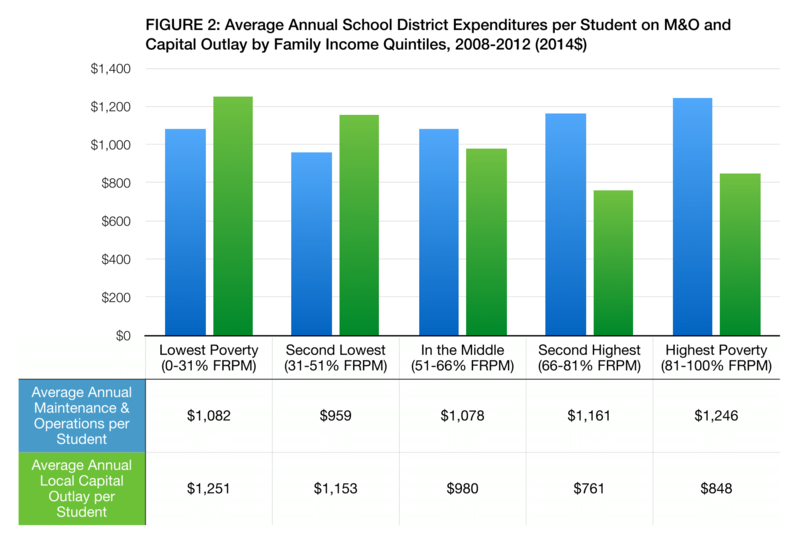 School districts with the most low income students (receiving Free and Reduced Price Meals, or FRPM) spent less on capital outlay per student and more on maintenance and operations per student than districts serving higher income students. Thus, districts with more low income students disproportionately draw from their general operating funds for M&O. These higher school building operations costs leave fewer dollars for education programs. The chart below shows average annual per student M&O and capital spending for all school districts divided into equal size groups (quintiles) based on their share of students on FRPM. Overall, we find that about 80% of California’s 6 million public school students are attending schools that failed to meet minimum best practice facility spending standards for maintenance and operations expenditures, capital renewal expenditures, or both. As policy leaders in Sacramento debate the future of the state’s school facility funding role, our findings of inadequate and inequitable school facility spending trends should raise flags for educators, parents and state lawmakers. So, can school districts “go it alone” without state support for maintaining and modernizing their facilities? It seems very unlikely, without some other major changes on the revenue side of the equation. Even with LCFF increases on the operation budget side, districts still face competing priorities in their operating funds and limited options on the capital side. The trend of underspending is cause for much concern because it comes with great cost: student health and safety are risked, building functionality declines, useable building life is reduced and educational program delivery is compromised. As poor facility conditions disproportionately affect students and educators in low-wealth communities, it undermines the equity priorities of California’s Local Control Funding Formula (LCFF). Establish stable and dedicated state funds for K-12 school facilities. Our findings suggests that few, if any, California school districts can go it alone and adequately fund their facilities across the spectrum from routine maintenance to major capital improvements like building replacement or new construction. Moving forward, the state’s K-12 school facilities funding approach should ensure that all school districts can reasonably meet their facilities needs across both their operating and the capital budgets through an appropriate combination of local and state resources. Distribute K-12 school facility funds equitably, adjusting for local wealth. To promote adequacy and equity in spending on K-12 school facilities across all districts, the State’s role, at minimum, should be to equalize the ability of all local districts to raise adequate capital dollars for their school facilities. Moving forward, California’s formula(s) for providing school facility funds to local school districts should be weighted in favor of districts with limited local tax base and high percentages of low income students. Improve standards for school facility planning and budgeting. Following the LCFF’s local control and accountability approach, school districts should have board-approved district-wide facility master plans that assess facility conditions and identify facility spending priorities to best support the education and health of their students and protect the facility assets. Establish a California School Facility Database to guide spending. The lack of a basic statewide inventory of all K-12 public school facilities, conditions assessments of those facilities, and full information on local school district facility spending is a major obstacle to fully understanding—and addressing—school facility needs in California. To uphold public accountability and realize adequate and equitable spending in all schools, consistent information sharing of public school facility data is essential. Implementing these key reforms will move California to a more coherent system of school facility finance that better promotes adequacy, equity, public accountability, and is affordable in the long run. Read the full study, Going it Alone: Can California’s K-12 School Districts Adequately and Equitably Fund School Facilities? Jeff Vincent, PhD is the deputy director of the Center for Cities+Schools at UC Berkeley.